Acoustic systems don’t have to cramp your space. Aluglass Bautech illustrates just how flexible acoustic treatment solutions can be . . . The value of good acoustics cannot be understated. Yet, the perceived rigidness of acoustic systems often prevents installation, because people dread being stuck with the same configuration for years. The good news is that not all acoustic systems are permanent or dictatorial fixtures. If one selects the right solutions, acoustics can allow ample flexibility, movability and are pleasing to the eye. While some may picture a dark, stuffy room with foam padding all over the walls, one doesn’t have to choose between light and sound. GF Serene demountable acoustic glass partitions are ideal for creating impromptu spaces while retaining a sense of openness and light, but with the added benefits of acoustic privacy. These are quick and easy to install, remove and reinstall, thanks to modular elements and flexible frame components. A big complaint about acoustic treatment is that you need to isolate rooms in order for sound design to be effective. 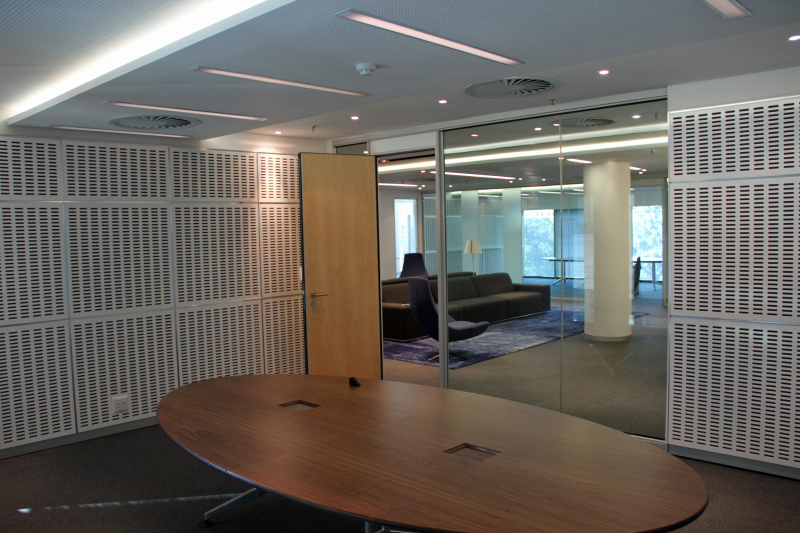 However, mobile acoustic partitions make it possible for a multifunctional space to be changed as needed. Aluglass Bautech’s Variflex mobile partitions are easy to handle and it takes minutes to create a space that is aesthetically pleasing, intimate and with good acoustic properties. For example, a conference venue can quickly be divided into smaller sections and elegantly separate space(s) or venue(s) right next to each other, without sound moving back and forth. Likewise, in an office environment, mobile partitions are ideal in creating private meeting areas, which can be disassembled with ease to return the office to its original open space set up. Variflex mobile acoustic dividers, move along ceiling rails and are perfect for dividing conference rooms into smaller areas. With Aluglass Bautech’s Varikust doors, it is possible to install an acoustic door as part of a mobile panel system. This means that when the panel is moved, the door goes along with it. It also allows entrance options: One can either move the panel and create a large entrance, or use the door for a more private and intimate configuration. 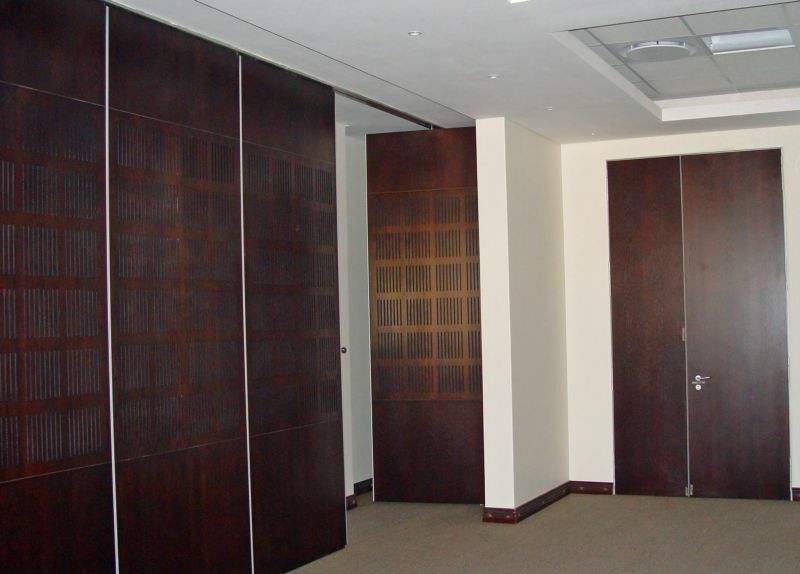 These doors are neatly crafted for an uninterrupted design that is slick and fitting. Absorption panels help to deflect and absorb sound, dramatically altering the acoustics in a room. Available in a wide range of finishes, these panels can double as artwork or be matched to the interior, making them less intrusive. What’s more, they don’t need to be nailed or glued to the wall. There are many modular panel components that make it easy to move them around as needed. There is no need for finality with modern acoustic design(s). With the right solutions, one can improve both space visual and sound quality. Aluglass Bautech – ENGINEERING QUIET SINCE 1973! Caption main image: The GF Serene system also integrates seamlessly with our Varikust VK62 acoustic doors and Variflex VX83 mobile acoustic walls with matching acoustic specifications to further enhance the integrity and flexibility of the quiet spaces created. What’s more, the modular absorption panels can also be placed where needed.